Oh Bullocks! The Queen’s tyranny is spreading into every corner of the kingdom. Her foot soldiers scour the countryside to hunt the behemoth—the bewitched king that was once her husband! Your small band of rebels will need sharp wits and a bit of luck to save the king and reclaim the land’s virtue, as well as your own. 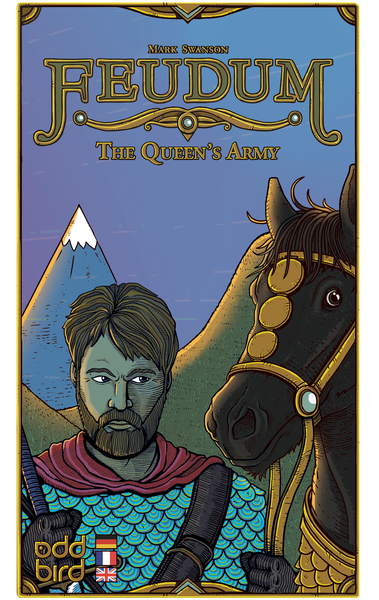 The Queen’s Army is a solo variant expansion to Feudum. The game pits you against Queen Ann in an epic battle to score the most veneration points over 5 epochs. Behemoth) in effort to diminish your fame. After the King is dead (or by the dawn of third epoch), she will mount her black horse to pursue your band of rebels with a vengeance. The Queen plays the game with unlimited resources and no movement restrictions. Any actual resources she acquires along the way count as veneration points! Can you thwart her quest for the King’s demise, while securing your own prestige? By the Sword of Leinad, you shall prevail!